Take a load off in our big fluffy chairs! Don’t worry; no annoying vibrations or fake massage buttons will be hitting you in all the wrong places. Instead, our chairs will envelope you and a warm compress will comfort your tired neck and shoulder muscles. And, since we only provide natural nail services, you won’t have to worry about those nasty acrylic smells accosting you while you are trying to relax. We use only the highest quality ingredients. Our products are fresh, pure, and natural. That means no paraben preservatives, formaldehydes, petrochemicals, and no artificial scents. Our organic scrubs are handmade fresh for each client before each service with organic honey, organic brown and cane sugars, and a dash of lemon and oil. Threads Beauty Bar’s award winning nail lacquers are the “greenest” available, excluding the three most toxic ingredients in other nail lacquers: Toluene, Formaldehyde and Dbp (dibutyl phthalate). Plus, they are super long-wearing! While your hands are soaking in a large ceramic bowl filled with a nourishing mild cleanser, smooth pebbles at the bottom of the bowl will provide a soothing sensation for your fingers. Cuticles will be softened with organic Shea Butter before being gently trimmed away. Nails will be trimmed and filed to your desired length and shape. Your hands and nails will experience a rub down with a lemon wedge, and a fine grain organic honey citrus sugar scrub will sweep away dryness and allow for moisturizers to readily penetrate. Warm towels will further relax your muscles preparing them for an attentive hand and arm massage using a blend of warmed natural oils. Finish with an application of a beautiful color from our collection of eco-friendly nail lacquers. Start your organic journey with a foot soak in a huge hand hammered copper bowl fit for royalty. While your feet are soaking in a nourishing mild cleanser, smooth pebbles at the bottom of the bowl will provide a soothing sensation for your toes and feet. Cuticles will be softened with organic Shea Butter before being gently trimmed away. Nails will be trimmed and filed to desired length and shape. Heels and calluses will be softened and gently sloughed away to baby’s bottom status. Your feet and nails will experience a rub down with fresh lemon slices and a fine grain organic honey citrus sugar scrub will sweep away dryness and allow for moisturizers to readily penetrate. Using a blend of warmed natural oils, your feet will enjoy a very attentive massage. Finish with an application of a beautiful color from our collection of eco-friendly nail lacquers. Slather your hands or feet (or both) in pure mud from the dead sea, abundantly rich in vitamins, minerals and trace elements that are oh-so-good for dry skin or swelling. Hands or feet will rest with warm towels to further assist the minerals to penetrate into the skin before being removed. Your hands or feet (or both!) will soak in oversized bowls filled with nourishing mild cleansers. Cuticles will be softened with organic Shea Butter before being gently trimmed away. Nails will be trimmed and filed to desired length and shape. Hands or feet will be moisturized with warmed, natural oils. Finish with an application of a beautiful color from our collection of eco-friendly nail lacquers. French Manicure or Pedicure Additional $10 ea. 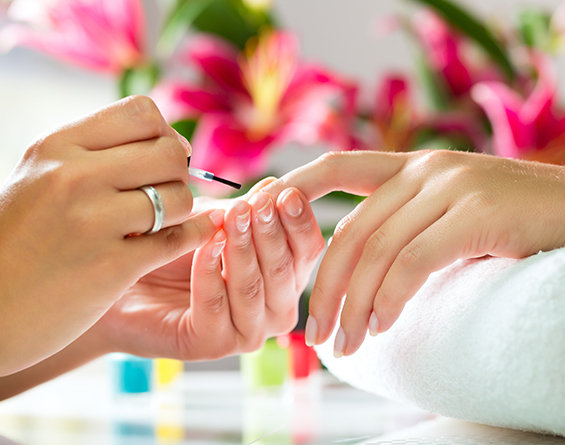 Click here to schedule a nail salon appointment today.